We conducted an optical study of the Ryukyu paintings at Okinawa Prefectural Museum & Art Museum on June 20-23, 2017. 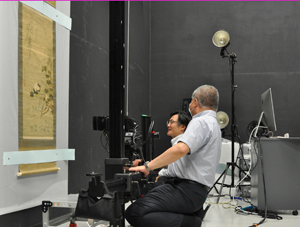 In order to investigate the depiction techniques and coloring materials, high-resolution color imaging and X-ray fluorescence spectrometry were applied for ten paintings held by the Okinawa Prefectural Museums and the Okinawa Churashima Foundation. Ryukyu-koku no zu, an important cultural property, held in Okinawa Prefectural Library was also investigated. Many of the Ryukyu paintings have disappeared due to the warfare of World War II, and sufficient research has not been performed. We have conducted optical studies of the Ryukyu paintings located inside and outside Okinawa Prefecture since 2008. Optical study of the Ryukyu paintings will continue to be conducted in the future and the results will be published. We believe that the study is of great help in deepening the understanding of the Ryukyu paintings. 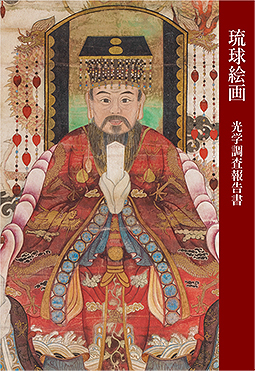 The 『Report of the Optical Study for the Ryukyu Paintings』was published by the Tokyo National Research Institute for Cultural Properties in March 2017. The Ryukyu paintings refer to paintings drawn in the Ryukyu islands during the Ryukyu dynasty era, although they have not been definitively defined. The paintings were largely influenced by Chinese and Japanese paintings, but the depiction and coloring are different from those paintings. Many of the Ryukyu paintings disappeared during World War II, and sufficient research has not been performed. We have conducted an optical study of the Ryukyu paintings located inside and outside Okinawa Prefecture since 2008. In this report, high-resolution color images and the results of coloring materials by X-ray fluorescence spectrometry were analyzed for eleven paintings held by the Okinawa Prefectural Museums and the Okinawa Churashima Foundation.. It is the first time that an optical study of Ryukyu paintings has been conducted, and we believe that publishing the results of the study is of great help in deepening the understanding of the Ryukyu paintings. We hope that this report will be widely used for research on the painting and art history of Japan. Although this report is not for sale, it can be viewed at prefectural libraries throughout the country. 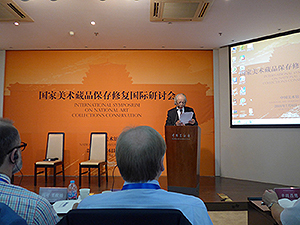 Dr. Yasuhiro Hayakawa (Center for Conservation Science) attended the International Symposium on the National Art Collection’s Conservation held in the National Art Museum of China, Beijing. The National Art Museum of China is the largest art museum in China and established the conservation center a few years ago. The art museum has been promoting the conservation of art works in the conservation center and has completed communication and cooperation with foreign conservation institutions. Fourteen researchers and restorers in the field of conservation and restoration were invited from Japan, US, UK, Italy, Germany, Hong Kong and Taiwan. Nineteen talks on topics such as the philosophy of conservation, examples of paintings’ conservation and results of scientific investigation were presented in the symposium. Dr. Hayakawa presented the research work of the material analysis of the Japanese paintings using cutting-edge technology. More than 30 directors of public art museums in China also participated. It shows that China is actively promoting the establishment of philosophy and the acquisition of conservation for artworks. In Asuka-dera Temple located in Asuka village, Nara prefecture, the statue of Shaka Nyorai (the so called “Asuka-daibutsu”), which is about three meters in height, is enshrined as the principal image of the temple. According to historical sources, the statue is considered to have been made by Tori Busshi in 606. It is an important statue because it is considered to be the first Joroku Buddha in Japan. However, there are various opinions as to which part of the statue was originally made by Tori Busshi because it was damaged by fire in the early Kamakura period. After the opening time of Asuka-dera Temple on June 16th and 17th in 2016, research on the preserved state and production techniques of Asuka-daibutsu was conducted by experts in art history, conservation science, restoration and three-dimensional measurement. This research was managed as a part of the “Japan-South Korea Joint Research on Bronze Buddhist Statues of East Asia from the 5th through the 9th Century” (the research representative is Prof. Fujioka of Osaka University.). 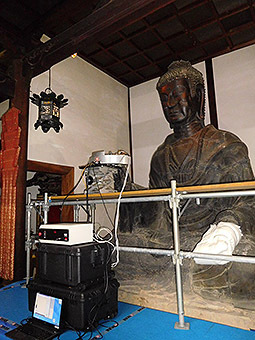 From the National Research Institute for Cultural Properties, Tokyo (NRICPT), Yasuhiro HAYAKAWA, Masahide INUZUKA and Mai SARAI participated in this research and conducted the investigation of materials on the surface of the statue by using a portable X-ray diffraction device (RIKEN KEIKI Co., Ltd., XRDF), which was introduced to NRICPT in the last fiscal year. Scaffolding was constructed around the statue, and then we carried out the measurement on the surface of the head and body of the statue (the number of measured points was 10). Together with the 3 measured points on a fragment considered to have been a part of Asuka-daibutsu, the number of measured points was 13 in total during this research period. The crystal structure of materials can be obtained by the portable X-ray diffraction device. The chemical compounds can be identified from the information about the crystal structure by combining the information about the elements constituting materials obtained by X-ray fluorescent analysis conducted by Osaka University and the National Museum of Korea. 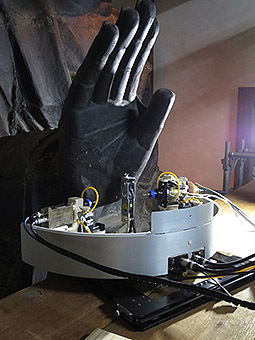 In this research, copper compounds existing on the surface of the statue can be identified and the comparison of chemical compounds on different measurement points will be possible. We are now analyzing these data in more detail, and plan to report the results of the analysis within this fiscal year. On November 10 through 12 following the first survey in August, we conducted an investigation into a pair of six-fold screens of “Birds and Flowers of the Four Seasons” (an important cultural property) at the Suntory Museum of Art. To investigate the production techniques and materials of the folding screens, we conducted research using an optical survey, fluorescent X-ray analysis, visible spectroscopy, X-ray radiography and other approaches. As for X-ray radiography, we obtained X-ray transmission images with imaging plates. For this research, we brought the developing equipment, which is dedicated to imaging plates and were introduced to our institute in November, to the Suntory Museum of Art. Accordingly, at the site, we proceeded with the research by confirming the X-ray transmission images each time they were obtained. These images gave us a variety of information such as types and thicknesses of the coloring materials and production techniques. We will summarize these research outcomes to publish a research report within FY 2015. On March 30, 2015, the National Research Institute for Cultural Properties, Tokyo and the Imperial Household Agency concluded an Agreement on Joint Studies of Works in the Sannomaru Shozokan Collection. Pursuant to the Agreement, works in the Sannomaru Shozokan collection that need to be conserved in the future and works that are significant to art history will be studied. Materials in these works will be analyzed and high-resolution photographs of these works will be taken in order to ascertain what materials were used in these works and how they were used. An initial joint survey was conducted at the Sannomaru Shozokan on April 6-15, 2015. 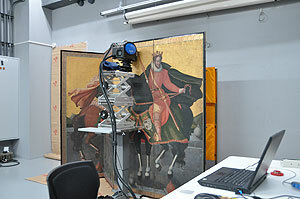 High-resolution photographs of 3 paintings were taken by SHIRONO Seiji (the Department of Art Research, Archives, and Information Systems), and X-ray fluorescence analysis of those works was performed by HAYAKAWA Yasuhiro (the Center for Conservation Science and Restoration Techniques). Joint studies are scheduled to take place over a 5-year period ending in March 2020, with individual studies being conducted 2-3 times a year. Colorants in survey maps by INO Tadataka (1745–1811) in the University Library of the University of Tokushima (known as the “INO Maps”) were studied scientifically as part of the Project to Authenticate the “INO Maps” in the University Library of the University of Tokushima (Director: FUKUI Yoshihiro, Library Director). This Project seeks to conduct a full-fledged study of the “INO Maps,” and colorants in the maps were scientifically investigated at the Library over a 4-day period starting on November 25, 2014. 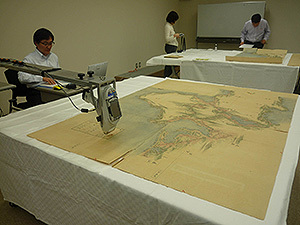 The “INO Maps” are the first Japanese maps based on a precise scientific survey. The maps have features of an early modern painting since they graphically depict terrain, mountains and rivers, and buildings in color. The current study used X-ray fluorescence spectroscopy and visible reflectance spectroscopy, both of which are non-destructive methods of analysis. These techniques yielded data with which to identify the pigments and dyes used. These data are currently being analyzed.